The teacher directs the students to focus their attention on one proficient reader strategy, modeling the kind of work that needs to be done. The students read and sticky note or code when they observe that they have used that strategy. The group comes together and shares their observations. While these groups are used to clear up misconceptions about reading, the focus is on how to use a new proficient reader strategy to do that. The students work together - under the guidance of the teacher - to practice using a new strategy for just a few days. Eventually, students return to guided reading groups where they use all strategies and all types of response. The most important thing about strategy circles is to remember to teach one strategy at a time. Many experts in the field recommend this one-at-a-time approach. Ellin Keene explained the importance of learning strategies one at a time when she spoke in San Antonio, Texas at a 3-day workshop I attended there. Jeffrey Wilhelm suggests modeling one strategy in his book, Improving Comprehension with Think-Aloud Strategies. Another source for teachers to read is Improving Comprehension With Questioning the Author by Isabel Beck and Margaret G McKeown. By reading this book I understood the value of teaching strugglers to ask why did the author say that or why did the author do that? By asking questions of the author, the focus became confusion over the writer’s choice of words not the reader’s lack of comprehension – a very important paradigm shift for students who do not want to admit their reading difficulties. 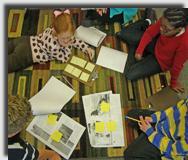 The ultimate goal of employing Strategy Circles is to teach readers to use all strategies. Your basal text probably has directions for using all the strategies jumbled together for one story. Ignore that unless your students know all strategies deeply. It’s like learning math. Say you are going to teach division. Would you plan to teach multiplication facts, subtraction, and estimation all the same day? This is not to say that if a student asks a question you put her off: "I’m sorry. We’re studying questions in December!" To be clear, study one strategy and honor the use of the other strategies when they come up in conversation. When teaching strategies, I choose short stories, poems, newspaper articles, and picture books. I like to use something that can be read in one reading-group time. If I use a novel, I select just a chapter so that we can study one strategy before we're back to using all our strategies. A great book to help you learn more about using short texts is Less is More: Teaching Literature With Short Texts by Kimberly Hill Campbell. Write out a lesson plan. I recommend Sarah Dowhower's plan that stresses chunking the text into sections, gradual release of responsibility to students, working students towards determining main ideas and themes, and reflecting for both the teacher and the student. I created my own lesson plan template as a result of reading Dowhower's article, "Supporting a Strategic Stance in the Classroom," The Reading Teacher, 1999. Read the first line or beginning sentences. That seems be a good place to stop, think and talk. After the first few lines, the reader usually has a sense of the topic. The problem may be set and the characters introduced. In nonfiction, the author often uses a narrative to introduce the topic, so the same might be true. It’s a good place to ask students what they are thinking and what they’re reading to find out (resetting their purpose after the overview ). Read to the next stopping point. Pick points in the same way you would when planning a Think Aloud. When first introducing Strategy Circles, you have to pick places that make you Stop and Think. There is no right place to stop. Tell the students that you are showing them where you stopped, but eventually they will be doing this on their own. They will gain practice with you recognizing where to stop so that when they’re on their own they feel comfortable listening to their own internal voice and doing the same. At each stopping point, ask open-ended questions. I learned about asking queries from reading Improving Comprehension With Questioning the Author. In this text, the authors draw a strong distinction between questions and queries. Questions can be answered with one-word responses. Often, the response is what the teacher was thinking so the teacher knows and expects one, specific answer. Queries, on the other hand, have no preconceived answer. Responses are long and involved. They require the student point to references in the text and explain their thinking. Queries evoke discussion by the other participants. Throughout the Strategy Circle, the teacher continues to explain how the students are using the new strategy. For example, if the strategy were asking questions, the teacher would depend on students to ask questions to keep the circle going. At the end, they might analyze the questions they asked, determine which ones produced the best discussion, and why. If the students were studying inferring, the teacher might make a double-entry chart to keep track of their thinking. She would write evidence on left side and inference on the right side. At the end of the lesson, students would analyze which inferences turned out to be true and which did not. They might discuss the words the author used that confused them and got them off track. By the end of the text, students should be ready to identify main ideas and themes and support their thinking with evidence. Finally, students reflect on what they learned about how to read better that they could apply to other reading tasks. The lesson may be carried over a couple days depending on the length of the text. Starting the next circle with the students’ reflections is a great way to highlight learning and lead into subsequent discussions. When introducing strategy circles, the teacher may find she is highly involved – more than she would like to be. She might take a strong lead in the beginning of the discussion, press the students to take the lead in the middle, and turn the circles over to them by the end. This idea is new to most students. They are used to answering questions the teachers ask by searching for that one correct answer. Be patient. Eventually, students will run the circles. So... slow down! Strategy circles at work! Often, each student brings one question to the discussion, which jumpstarts 30-40 minutes of discussion. Sometimes the process seems painfully slow. However, it has been my experience that over time the process speeds up considerably as the students gain confidence. They learn to reference the text with the page number and read the confusing part aloud for their circle-mates without being asked. They learn what needs discussing and what can be passed over. The hardest part for me as a teacher is not to answer the questions. "Wait time" is a skill I work on constantly. Allowing and encouraging readers search for answers takes patience. It would be so easy to just point them to their mistakes and move along. Letting them discover different meanings of words will stick with them longer and allows students to feel successful. Understanding the value of mistakes, and joining the world in making them, but learning from them, is what I wish for my students. This lesson is learned within the safe structure of any reading circle. It's one of the best lessons I believe I can teach my students to apply to many other situations. In skills teaching the teacher tells the learner what to do and then corrects or marks the response. In strategy teaching the teacher induces the learner to behave in an appropriate way and encourages the learner to confirm or correct his own responses; the teacher does not usurp the control which is crucial in mastering a strategy.